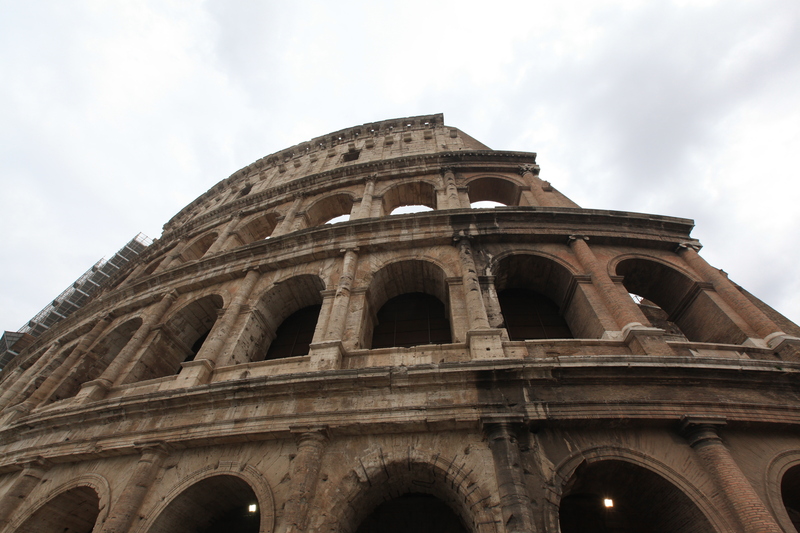 Italy Part 1: Rome | Mike Evans. Just a short time ago I finished a bike ride across the United States. During that trip, I spent a lot of time documenting the beauty of the land I had gone through as well as my unique experiences interacting with the people and places of a great nation. Towards the end I waxed more philosophic and shared some of my beliefs and learnings from the trip. I promised to write a little bit more about my time adjusting to life at home. But… well… that sounded kind of boring to write about and I haven’t really gotten around to it. Instead, I’ve gone on vacation to celebrate being married for 15 years to my beautiful bride Christine. First thing I notice in Italy: People all speak Italian. This may sound silly, but actually it is become quite hard to find a place to travel where the language barrier adds to the sense of adventure in a foreign land. I’ve been to France, Italy, Czech Republic, Austria, Budapest, Vietnam, Cambodia, Canada, Australia, New Zealand, Britain, Mexico, Costa Rica, Nevis, Ireland, Spain, BVI, and Bermuda. Italy and Canada are the only two places I’ve visited where communicating in English is challenging. A lightning 10 minutes after the fasten seatbelt sign went off, we found ourselves curbside outside the airport. 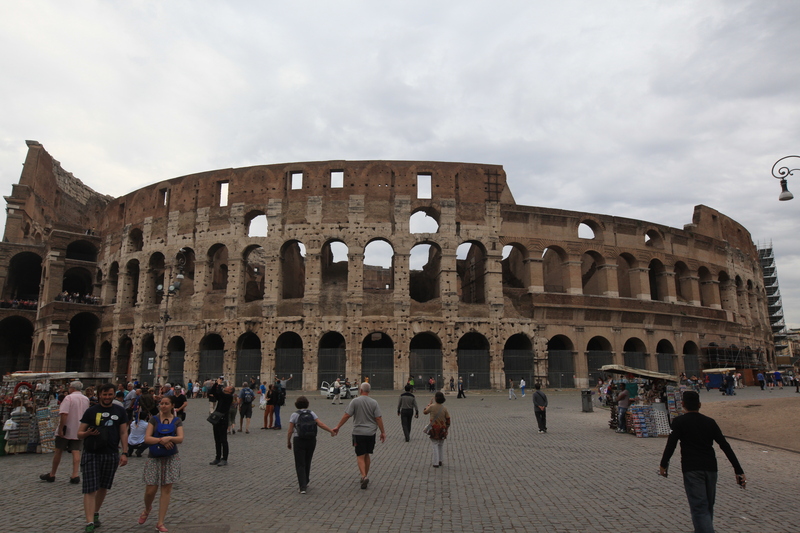 I had hoped to get exact directions to the hotel, but a few fumbled handoffs after visiting a car-service counter left us a little dazed and confused with a vague sense we needed to go somewhere near Rome. Good Enough! 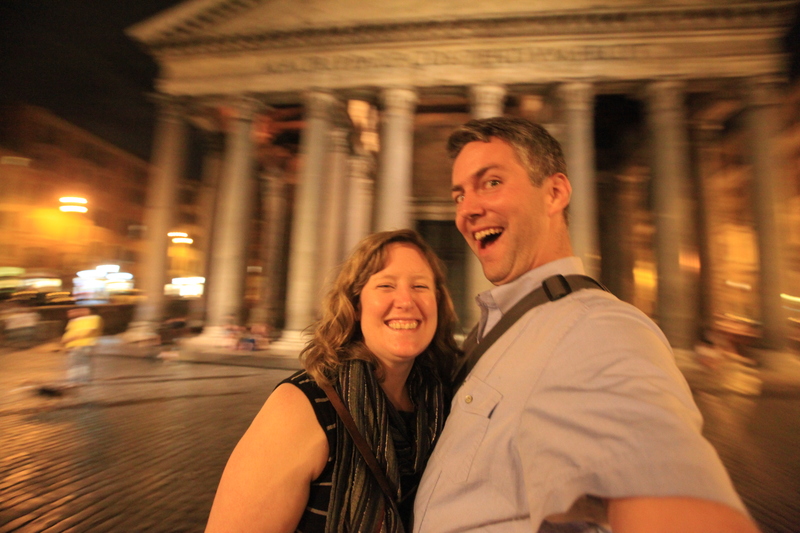 We hopped in a cab and said “Roma!” with a firm plan of figuring it out as we went along. With a sickening lurch in my gut I realized I didn’t even have the name of the hotel. Accessing email over the mobile network was going to be crazy expensive. With a prayer to whatever technodryad decides such things, I opened my GMail app with fervent hopes that it hadn’t decided to be surly. 50/50 chance it will simply say it doesn’t have a connection vs displaying the most recent email I had viewed, which would surely be the hotel reservation. Fortuna smiled upon me, and I was able to figure out our destination. Not much to report for jetlagged evening number 1. Mostly just eating pasta and passing out for 12 hours. Fantastic! The next morning, we pointed towards the center of ancient Western civilization and started walking. I’m at heart a city boy, and Rome is a city that’s been working at being a city for 2,500 years. So, a lot of things are easy to place: traffic controls, security on windows, 4-5 story architecture, specialty shops, bustling crowds, sidewalk cafes. Though the language barrier is pretty thick here, the pace and flow of the city life is as familiar as a 2:00 AM burrito at Garcia’s. 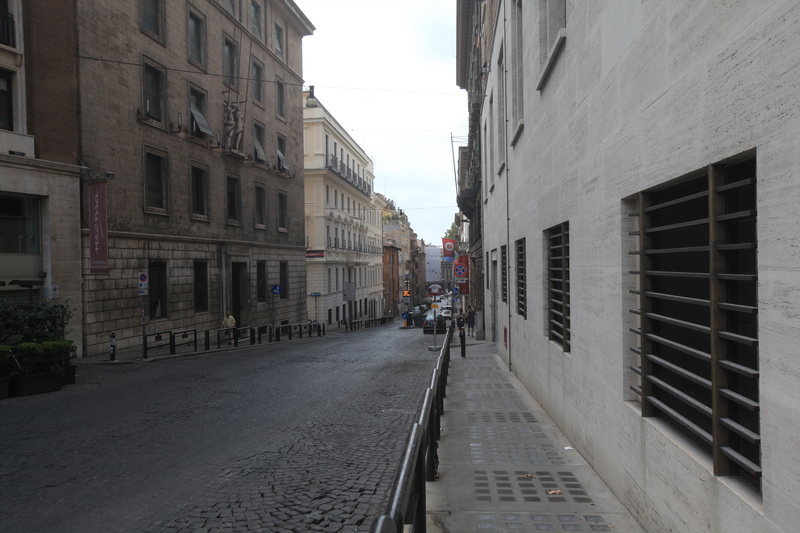 Rome is a city of layers, and just beneath its urban facade is… well, another urban facade. And then another one under that… and so on back a couple thousand years. 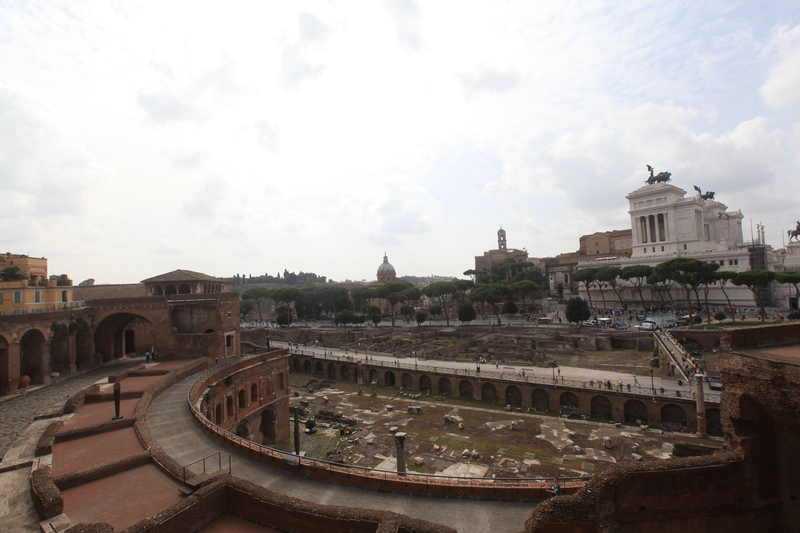 Just adjacent to the ancient forums is a restored/maintained semicircular marketplace from the same era. 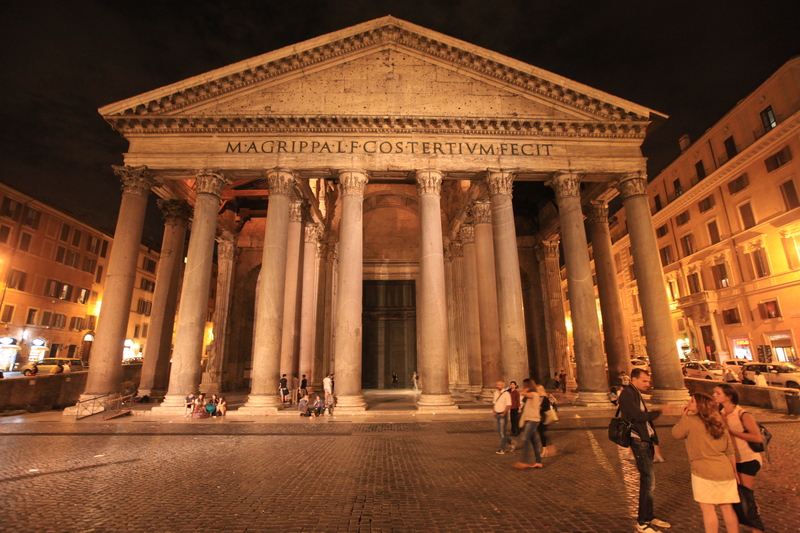 In what were once shops a couple thousand years ago now stand various statues, columns, and marble building remains. Lots of deep information about the art and architecture that adorned the buildings is all multimediad upon the senses. But really it is stepping outside and seeing brick and mortar laid down thousands of years ago that really hits you in the chest here. In the background, the “wedding cake” is a monstrous marble building built in 1900. It gives a hint of what this place might have looked like with massive buildings of whitewashed marble dominating the scene. Alternatively, you could just watch Gladiator and skip the weird parts where Jaoquin Pheonix is getting all Skywalker on his sister. 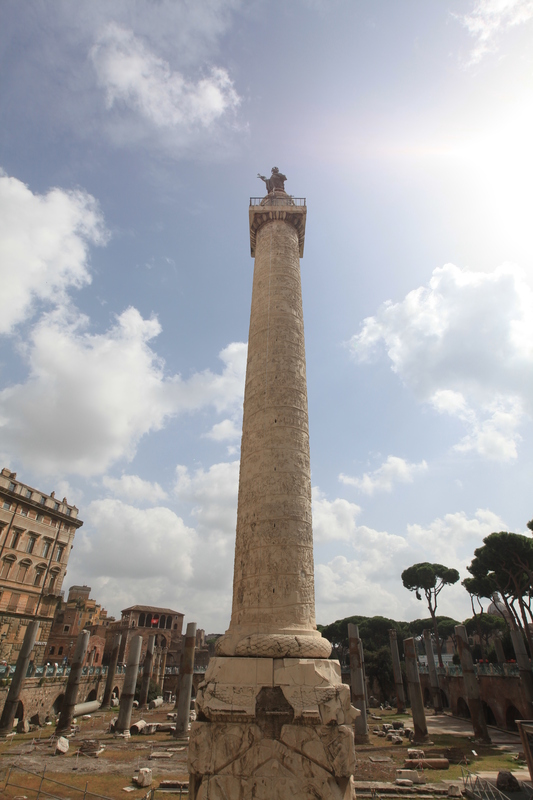 Trajan’s Column boasts a spiraled bas-relief history of Trajan’s conquests. Dinner that night was pasta accompanied by a few aperitifs, a bottle of wine, and then some digestifs. Somewhere halfway through this, the cameras got turned off to prevent incriminating evidence. 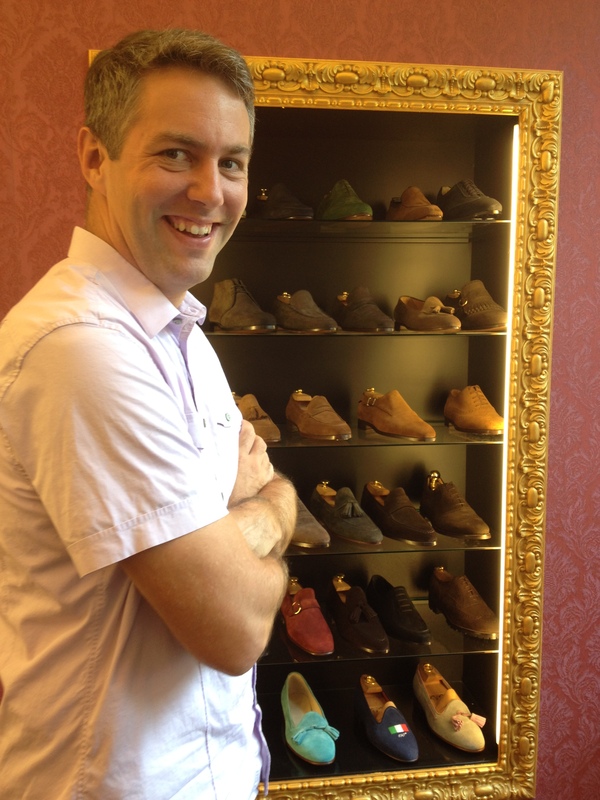 On the way home we passed by a bespoke shoe shop, Bocache & Salvucci. The shoes looked AMAZING. In my inebriated state I promised myself to come back the next day and get a pair of shoes. (Several people I know have benefited from my inebriated promises. Why not me too?!) The hotel concierge set up an appointment and off to the store we went. I’ve had some challenges with getting a pair shoes… as in, ‘Get these torture devices off my feet before I bleed to death’ kind of challenges. Did you catch the fact that the store was appointment only? Danger! Pull Up! Pull Up! The process was intoxicating. In a world of slave labor big box clothes pricing, this shoemaker stood on the opposite end of the spectrum. 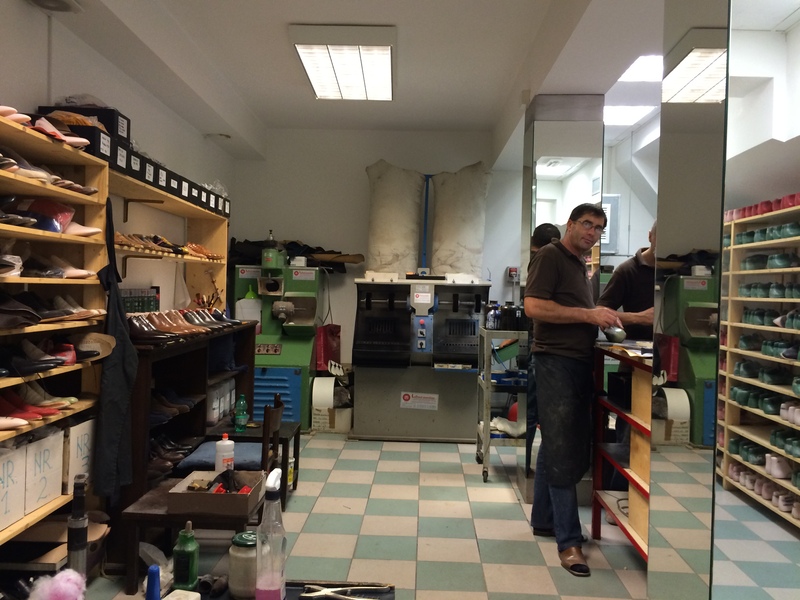 Imagine a bespoke custom shoe operation located in the middle of Rome. It employs 7 people, many of whom are much more interested in drinking espresso & smoking cigarettes than working. But Hot Damn! They make it look so cool! 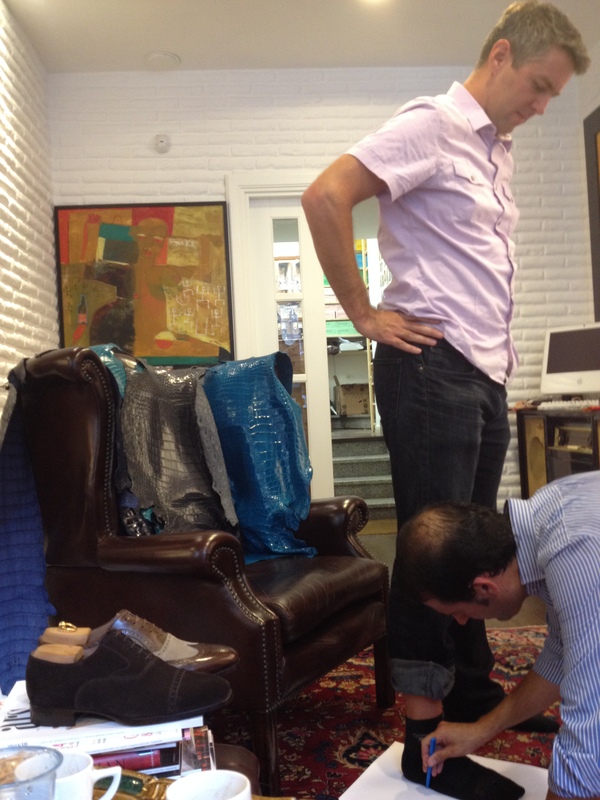 The first step in the process is measuring the feet. This takes much longer than you’d imagine as every piece of podiatric eccentricity is painstakingly quantified. Then, they’ll make a “last”, which is a model of my foot that exactly fits the measured dimensions. I couldn’t quite tell, but I think it was a combination of form molded plastic and wood. At any rate, they keep the lasts for decades so that you can call them up and order another pair of shoes at some point in the future. The soles and the uppers are made entirely from hand. They have some old school sewing and woodworking equipment to make this magic happen. It all comes together with a hand made construction process. The proprietor/master cobbler comes to NYC every couple of months. Sometime in the November-December time frame I’ll meet him there and he’ll do a final set of adjustments on my completed shoes before handing them over. All this for only $149 Euros. Ok, to be honest, it was a smidge more than that. Looking at options for a new pair of shoes. The look on my face says… Am I really going to do this? Hell yes I am! Ridiculous bespoke purchases now behind me, we were free to see the rest of the city. 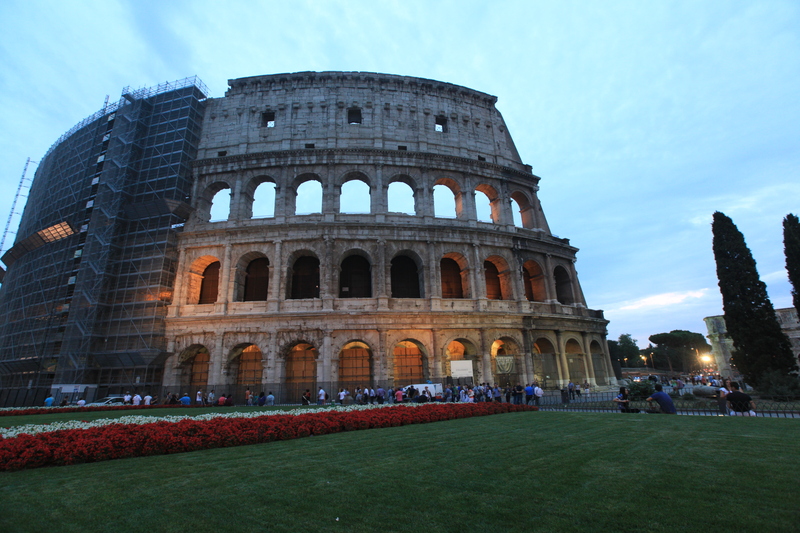 Over the next couple of days we were able to see many of the beautiful sights of Rome. 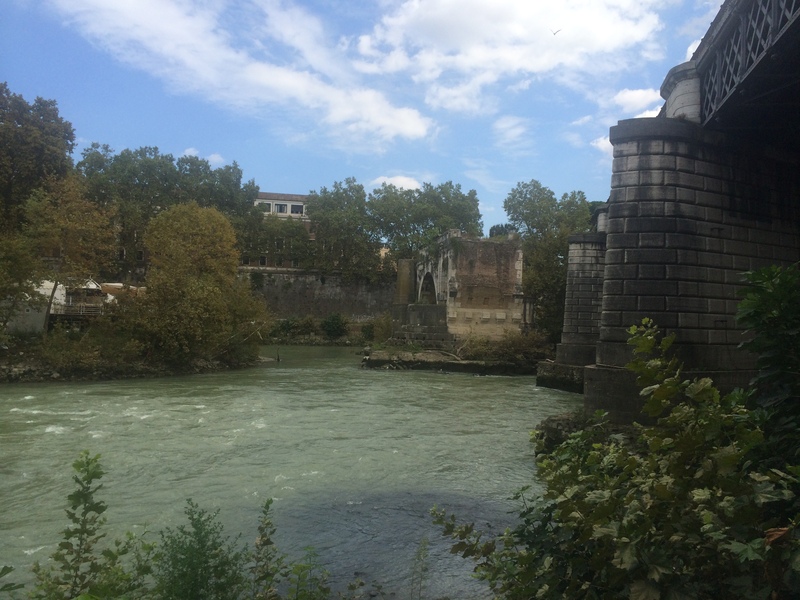 I went for a 7 mile run along the Tiber river. Jogging past the field of Mars, where legions once mustered to go forth and conquer Gaul, requires a little bit of imagination to place the historical significance. But the history is just so close. Right beneath the surface of the eternal city. New bridge and old bridge. Just South of Tiber Island in Rome. 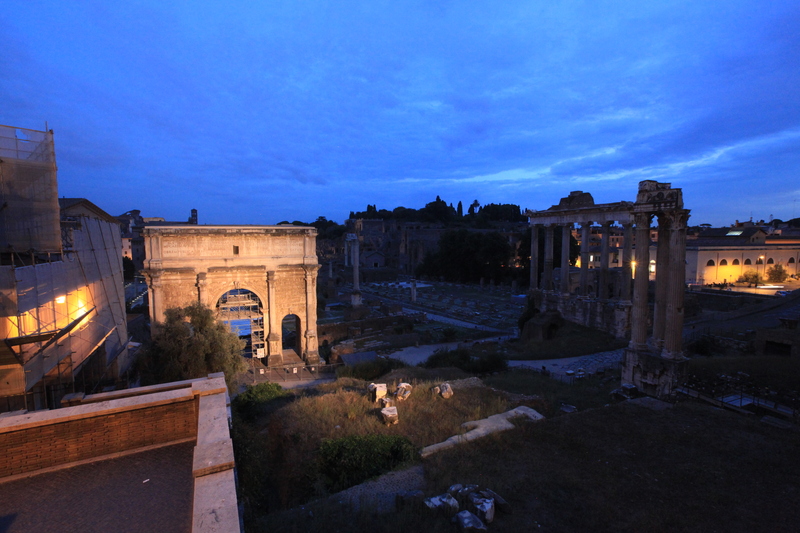 The “old” bridge is relatively new by Rome standards: only a handful of centuries. 1. The Colosseum is big. Even by todays building standards this is a truly massive public building. 2. 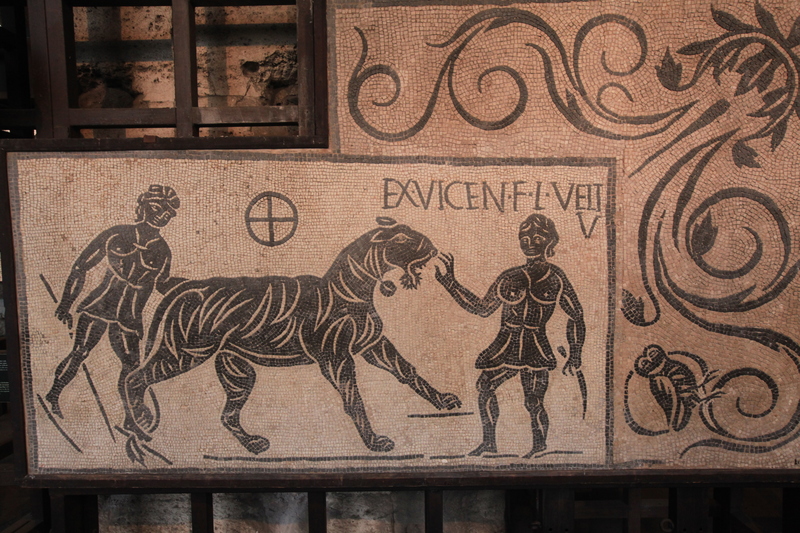 The Romans were incredibly violent. Every manner of person died in a shockingly impressive variety of ways for the entertainment of a whole cross section of society. 3. Even after 500 years of looting in the middle ages, nearly 2/3 of the original sturcture is still standing. Did I mention it was big? People have been milling around in front of this building since the Cubs won the series. It is THAT ancient! Our guide was very excited to tell us about lady gladiators. 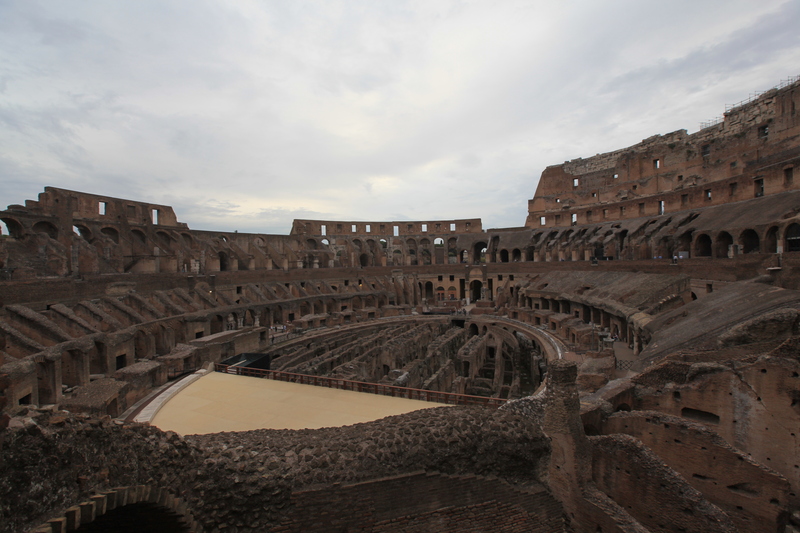 Inside the Colosseum. Part of the wooden floor is reconstructed. Sun setting on the Colosseum. 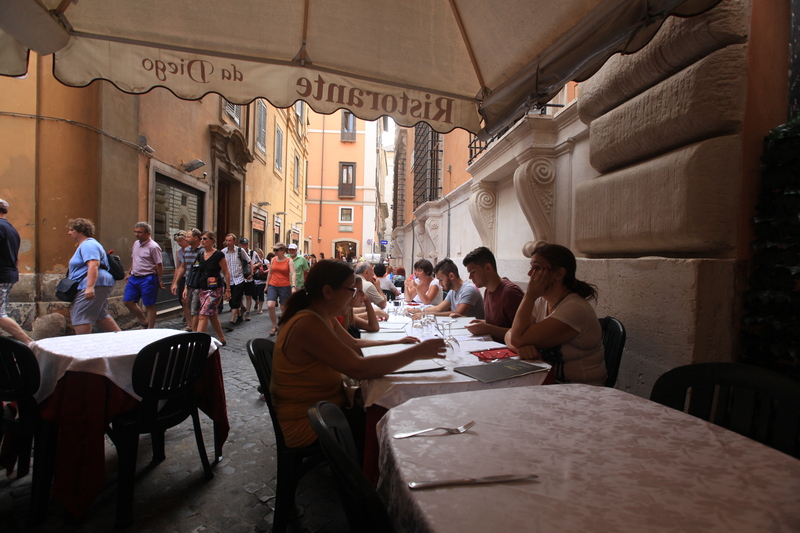 For our final evening in Rome, we wandered through the ancient sites and the modern city eventually having dinner at the public square directly in front of the Pantheon. Yeah, yeah, another amazing building from an age of legends. Whatever. Pass the balsamic vinegar. So good to hear from you! I can’t wait to see Rome. And, to enjoy this through your eyes is another treat. Your wife is beautiful, she must love having you back. Woo hooo .. Mike is back! 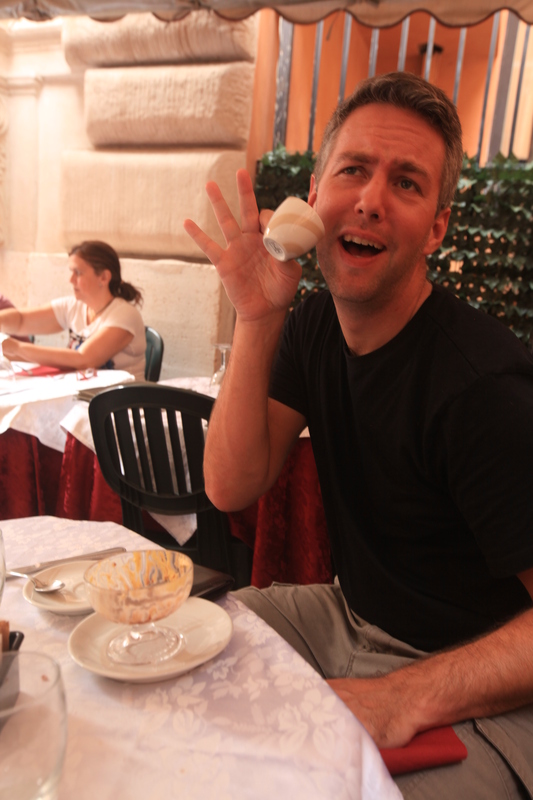 Please tell me every thing (except a few things I don’t need to know) about Italy … I love that place, spent two good years there studying and travelling the country and the region, years ago! All my italian tailored shoes and handbags (had them made in Florence) still get compliments at fashion weeks (I live in NYC) today despite they are one and half decades old already. Christine will definitely love them! Spoil her !!! !